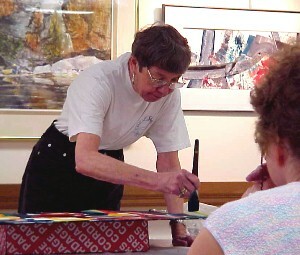 I met watercolorist Pat Deadman of Corpus Christi, Texas, several years ago and liked her immediately, which prompted me to take her workshop in April in Fairborn, Ohio, not far from my studio. Pat is an ideal workshop instructor, at least for me. Her demos are short and to the point; she has a great sense of humor; and she has a way of stimulating her students to work hard and think they're playing! Q. How would you characterize your work? A. 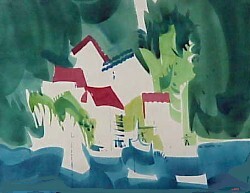 Most of my work is abstract landscape. It has been called "designed realism." A. We worked in different media when I majored in art At Ward Belmont College in Nashville, but I didn't embrace them. I seemed to have an affinity for watercolor. 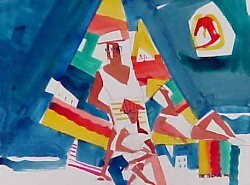 When I got really serious about art, around 1970, it had to be watercolor. Q. Since abstraction is your strong suit, let's talk about that. How did that evolve for you? A. It was a gradual transformation from realism and I just went with it. I seemed to be attuned to shapes and developed a greater awareness of how things fit together. The design elements became more important than the objects I was painting. Q. How would you advise artists and students who are interested in moving from realism to abstraction? A. Do lots of looking, lots of painting. Search for the essence of a subject. It's like learning a foreign language and takes lots of practice. Q. Here's a question I hear over and over: How do you know when your painting is done? A. If you can't decide what you want to do with it, stop! It's probably done. When in doubt, don't! Q. Describe your workshops for us. A. I generally do two full-sheet demos per day, about 30 minutes each, then let the students work the rest of the time. This way they paint more. Each demo is based on a simple concept, such as repeating a shape or working with two lines and a shape. Every student does something different. Q. And finally, what question do you ask yourself the most when you're planning a painting? A. What can I leave out? What can I do without? Thanks to Pat Deadman for sharing with us. You can email Pat at email:patdeadman@aol.com. Be sure to visit her web page: www.artshow.com/deadman/. Pat's work is featured on p. 85 of Exploring Color.